A sovereign man/woman lives in their “private capacity” possessing unalienable rights and properties. They may volunteer to act in a “public capacity” granted revocable privileges and benefits which are the mere civil rights of an artificial legal person. Governments incorporate (form) artificial legal persons of many kinds by registration, presuming a franchise benefit to the State's legal society. Legal persons include: citizen, resident, inhabitant, driver, individual, taxpayer, employee, voter, and owner. They are servants, transmitting utilities, debtors, decedents, or incompetent wards of the State. 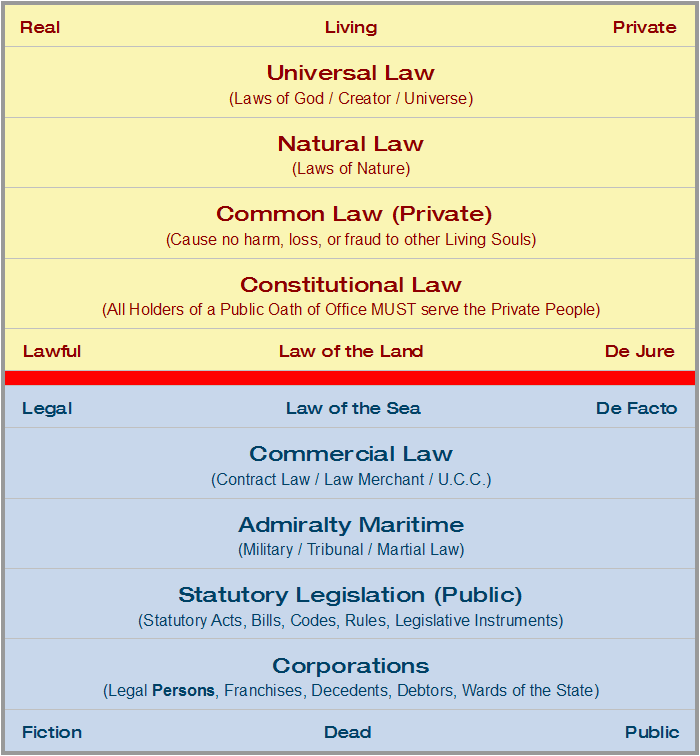 INCORPORATION transfers ANYTHING from the sovereign national “Law of the Land” (Common Law Jurisdiction) into the foreign international “Law of the Sea” (Admiralty Maritime Jurisdiction). Whenever people “act” in a “public capacity” as “public servants” they are accountable to the State if they fail to perform their role as contracted. Whenever people “live” in their “private capacity” as “private sovereigns” they are accountable in Common Law if they cause harm to any living soul. If you “act” in the “role” of a “legal person”, you are crossing the line into the lower world of the legally dead, surrendering your unalienable rights as a living soul.